Last Tuesday saw the Trustees meet to consider the 2016 Accounts and the Trustees’ Annual Report as part of an agenda that totalled 18 items. With the M6 closure between Lancaster and Preston looming at 10 pm, the agenda was rattled through in under two hours, which just left Alison’s pile of sandwiches and cakes to demolish before we all set off for home. (Thanks, Alison!) A decision that will affect all members is the setting of the date for the AGM, which will take place in the shed at Preston at 19.30 on Tuesday evening, 27th June. The usual working parties took place at Preston on Wednesday, Friday and Saturday, with Keith also appearing on Sunday to take forward restoration on Wootton Hall. 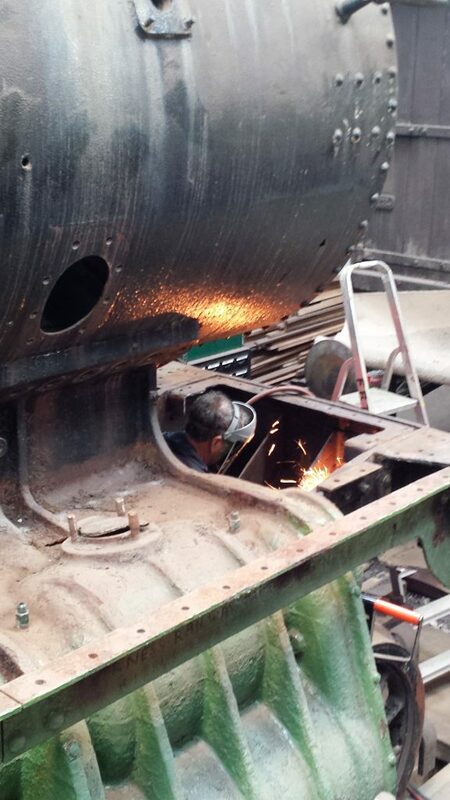 As can be seen, work has been progressing on stripping down the front end of the engine, and George has been needle gunning the buffer beam. 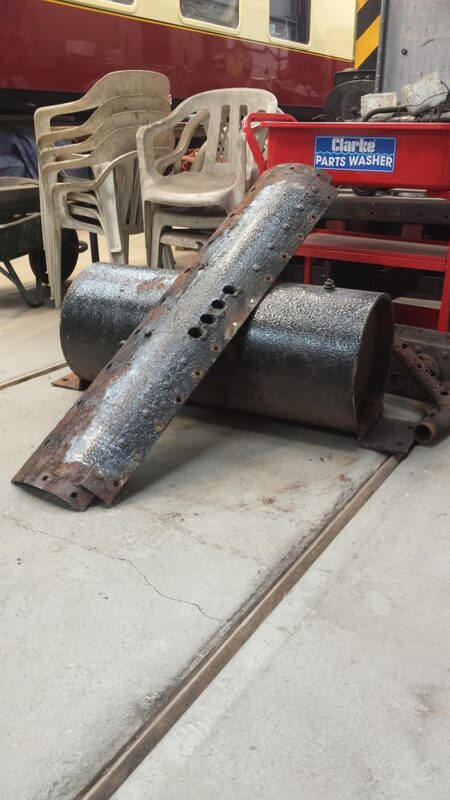 The front buffers have also been cleaned up ready for painting. 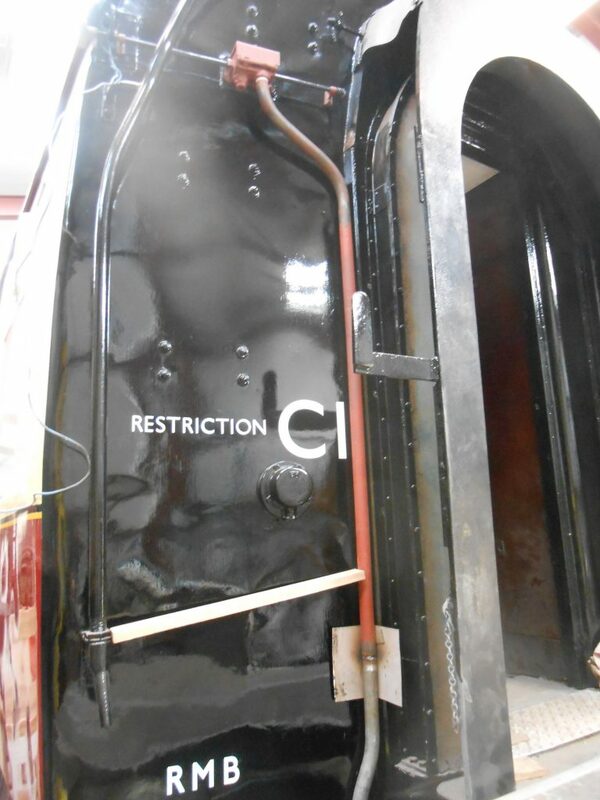 There has been more progress on the RMB where Tim has applied gloss black paint to the east end headstock and John has been attending to rotten wood floor at door entrances. 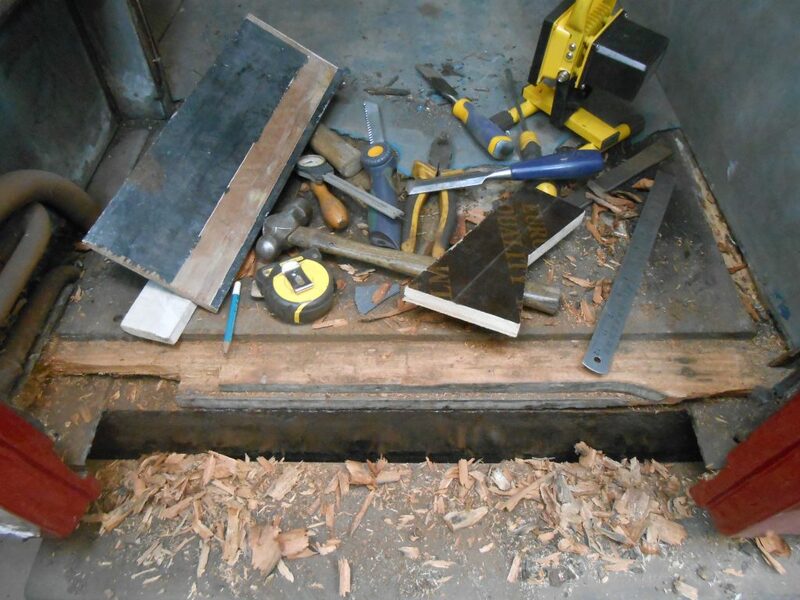 This photo shows the nature of the problem together with the vast array of tools that John uses to remove the rot and to fashion up some replacement wood – only another four door entrances to go! Mike has again been attending to the interior. Adrian reckons to have removed the last areas of rust and old paint from beneath Caliban‘s frames and also given them a coat of red oxide. Adrian is now threatening to create even more dust when he sets about cleaning off the running boards. Howard has confessed to breaking yet another part of the sanding gear in his attempts to free it up, but is making amends by conjuring up some replacement parts. It has been another week of steady progress on our projects at Preston. John has been preparing and fitting new step boards to the RMB, the RSR joinery dept having planed up some useful second hand wood to specification. Just a case then of filling some old nail holes, chamfering off the edges and corners, and then fitting them. A A couple of door rebates also needed rectification, and all the door grab handles have been polished and fitted. Mike has spent yet more time in the south side toilet but tells us that he feels a lot better now that he has managed to re-fit the door! 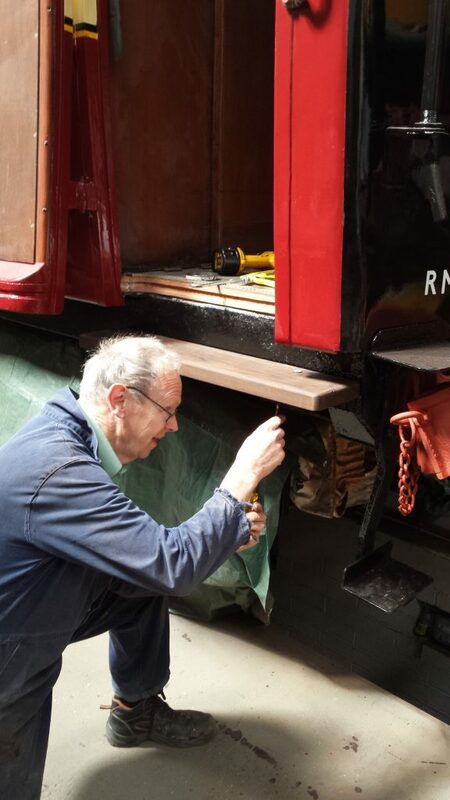 David has been out with his sewing needle, repairing seat covers and Tim has started the job of painting the east end head stock, which somehow seems to have been omitted from previous painting operations. Mike and Paul have again been busy experimenting with the creation of moulds for the replacement of missing plates on the RMB under the frames. Paul is seen here pouring a substance which appears to have some resemblance to blancmange. 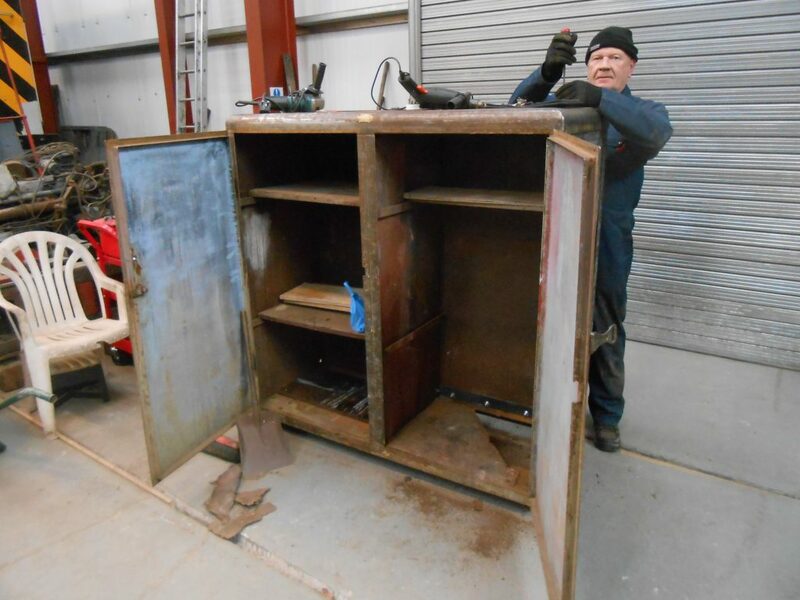 Paul has also made more progress with cleaning down the new paint cabinet, which will no doubt be receiving a coat of red oxide very shortly. 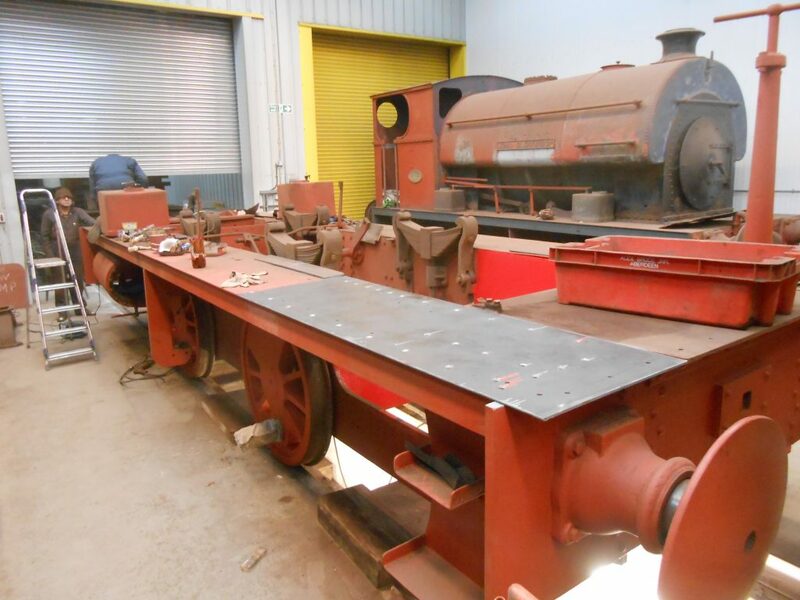 Work has again continued on Caliban; yes there has been more dust from Adrian, Howard has broken another part of the sanding gear with his hammer, and work has progressed on the running board. Keith, Fred and George have continued their labours on Wootton Hall where bits continue to be removed from around the front end for Fred to clean. 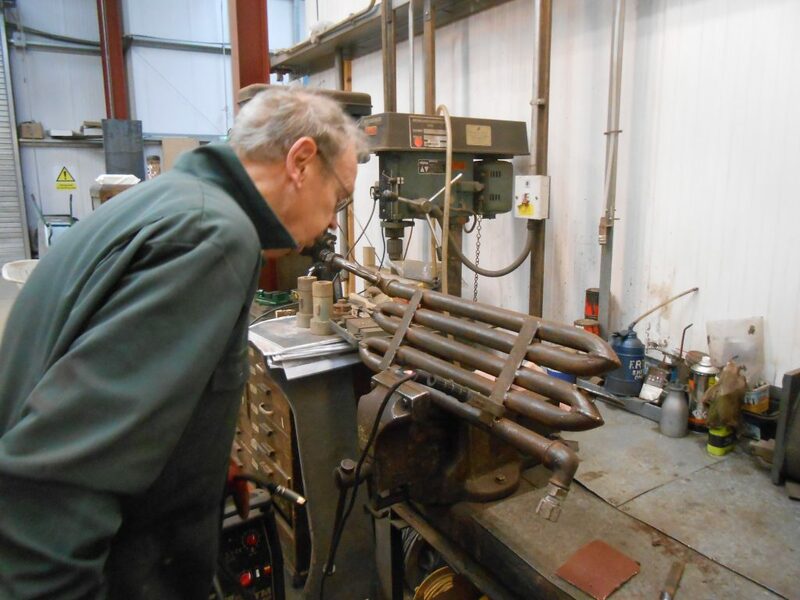 There has also been a search for copper tube of the right specification for the lubrication system, but this has proved to be somewhat of a challenge for David, despite the power of the internet. The Trustees are meeting tomorrow evening at Alison’s house to review the Annual Report and Accounts for 2016. On previous occasions Trustees have departed after the meeting to find either the M6 or the A590 has been closed – as a result one arrived home at 01.45 in the morning! Sure enough, this latest meeting has coincided with a planned closure of the M6 south of Lancaster, so there will be some pressure to get the meeting finished pronto! Mike and John were busy last Wednesday in their efforts to complete outstanding jobs on the RMB. Mike spent even more time in one of the toilets (and they’re not tested yet!) whilst John attended to the replacement of grab handles, footboards and steps. 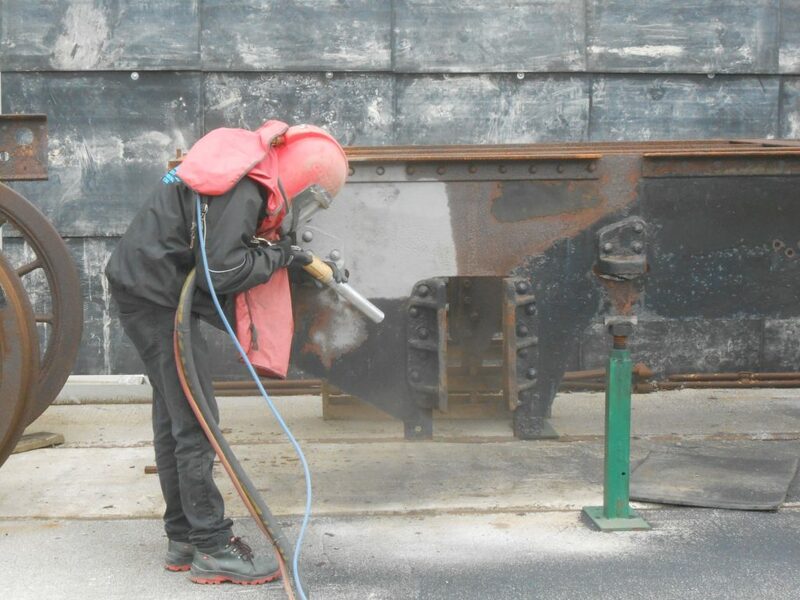 Adrian was again busy cleaning Caliban‘s frames, and Alan and John did more work on the running boards where corroded areas of steel are being cut out for replacement. Fred appeared on Friday to clean off the second of Wootton Hall‘s front buffers. Tim and Mike Bailey of Ribble Steam Railway had a useful visit on Wednesday to Rochdale to see our joint solicitor, Richard Greenwood, in order to progress the sub-lease for the shed. Alan and Alison went over to Locomotion, Shildon, last Friday in readiness for FR 20’s three days in steam, with Tim planning to join them on Sunday evening to crew FR 20 with Alan on Monday. This plan altered when it became apparent that there was a shortage of drivers at Preston, so Tim took the Sunday turn there and Keith agreed to move to the Monday slot so that all RSR days were covered. Tim then headed over to Shildon on Monday morning, with the family – no need to get there early, said Alan, we’re in light steam on the apron in the morning. When Tim got as far as Levens the phone rang: it was Alan to report that the other loco at Shildon, Beatrice, had failed (with a broken spring) and that FR 20 was now due to start operations at 10 am! After a rapid journey over the Pennines, Tim arrived just as the joint resources at Shildon had completed the swift preparation of FR 20 and in time to move the loco into the platform ready for service – phew!! We are pleased to be able to report that FR 20 then performed faultlessly all day during six hours of continuous running on the demonstration line. George called in at the Battlefield Line on Sunday to see how Cumbria was faring, but the winter maintenance work hadn’t quite been completed. A test run was being arranged for the Sunday evening, which the Battlefield Line report went well with the knocking from the bottom end “eliminated” thanks to the re-machined and refitted big end bearings. 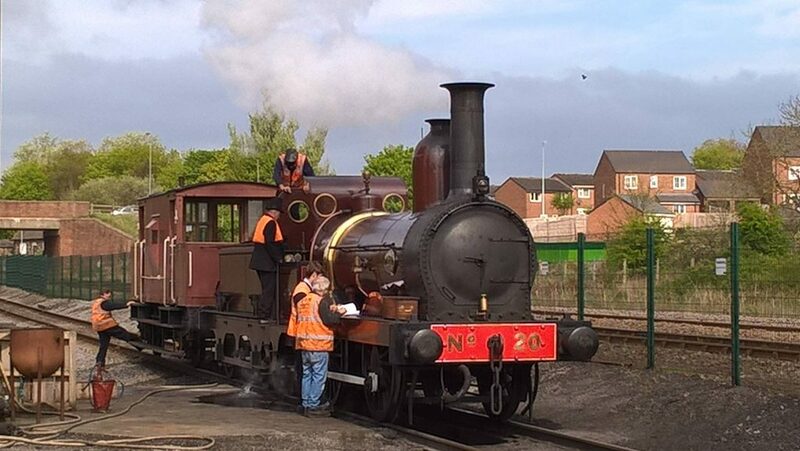 They say thank you all for providing the locomotive which has been a real workhorse for them. There is plenty of action from this last week to report. 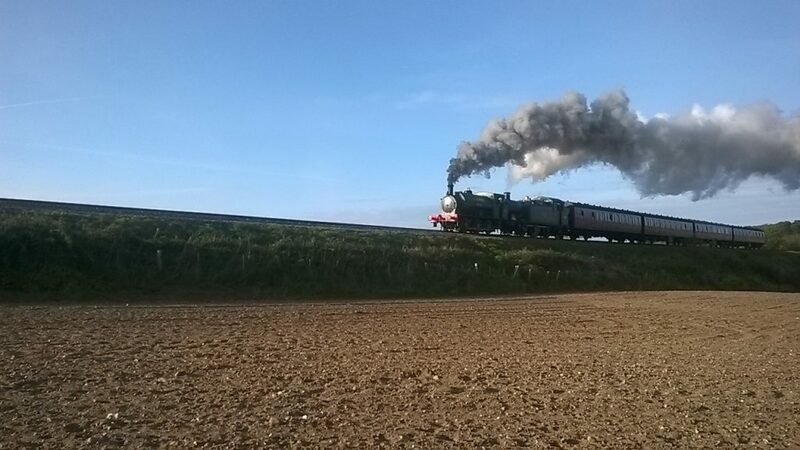 5643 duly arrived at Sheringham on the North Norfolk Railway last Wednesday in readiness to take part in the North Norfolk Railway’s Spring Steam Gala on the Friday, Saturday and Sunday. 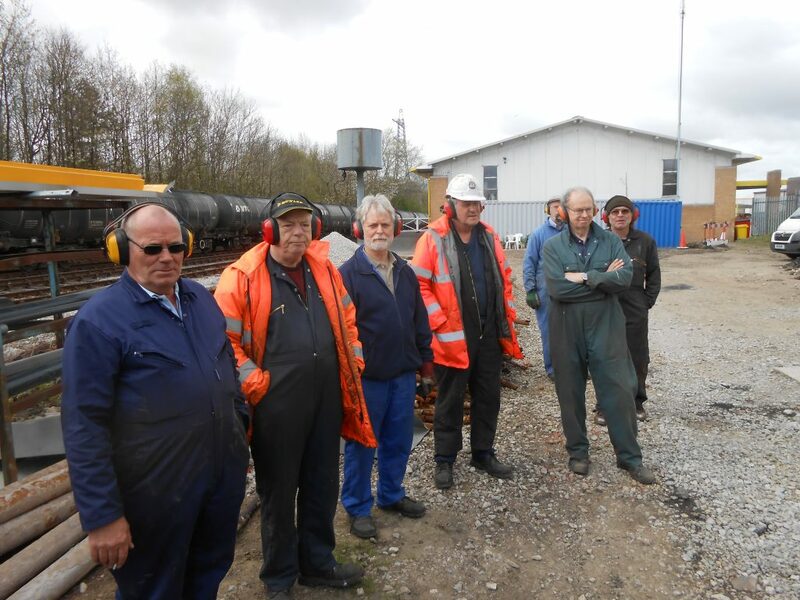 George travelled down to Norfolk on Friday afternoon and was at Weybourne shed at 05.30 on Saturday to assist the crew in the preparation of the locomotive. We’re not sure that Keith was overly impressed to receive a phone call from George at 06.30 to discuss the finer points of the lubricator, but the advice given was no doubt appreciated! 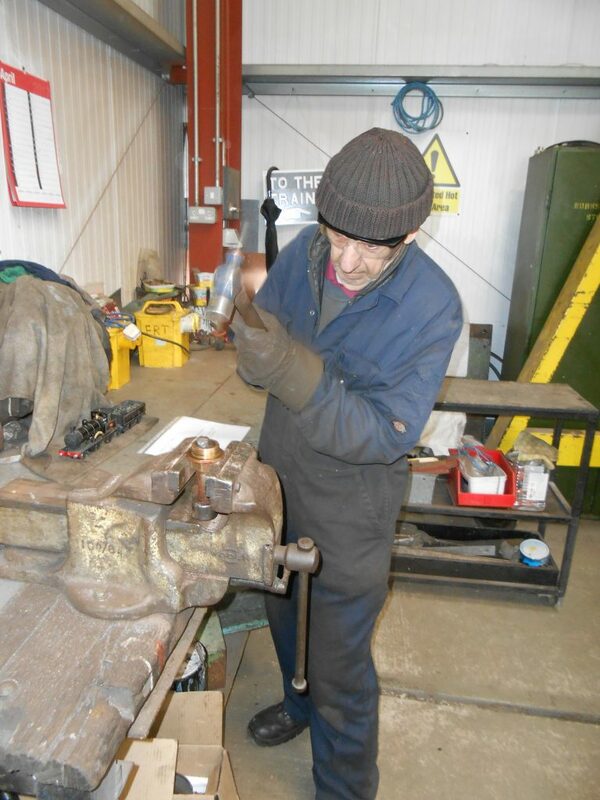 Unfortunately, George was also back at Weybourne shed at midnight to assist with the fitting of a replacement spring on the left hand rear driving wheel – just to prove that these trips out with a loco aren’t always jollies! 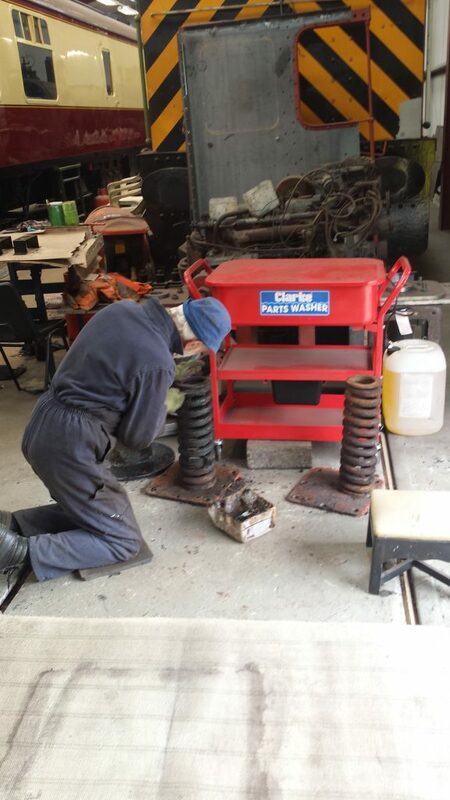 Fortunately, having previously had 5619 on long term loan, it didn’t take too long for the fitting staff to put in the new spring – George was impressed with the lifting table which made the job much easier. Thanks go to George for taking the time out to go to Norfolk for us, and for these photos including the double-header with Ring Haw. Alan and Alison have been up to Locomotion, Shildon again (yes, the campervan is back on the road after extensive repairs), where FR 20 was scheduled to be in steam over the two days. The Saturday steaming was mainly for a private birthday party in the afternoon, which was just as well as a problem with the right hand steam injector valve in the morning (shall we just say that it was being closed rather too enthusiastically) caused the steam pressure to have to be blown down so that the valve could be replaced. However, all was well in good time for the birthday party. 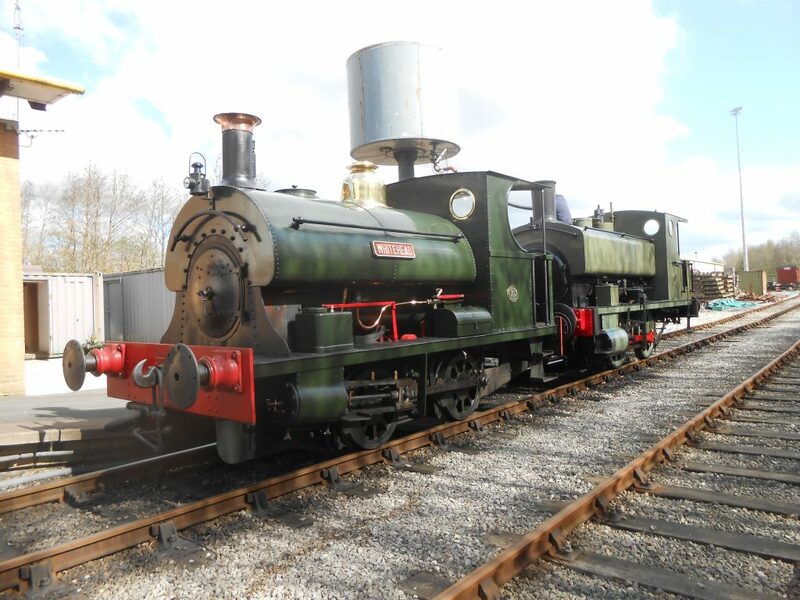 Alan and Alison are back at Shildon this next weekend for the Spring Gala there when FR 20 will be joined by Beatrice from Embsay on the demonstration line on Saturday, Sunday and Monday. To complete coverage of our three operational locomotives, Cumbria passed its steam test last Thursday and is scheduled to be in steam at The Battlefield Line this next weekend once the big ends have been reassembled after winter maintenance work. Back now to home depot, Preston, where work on the RMB has continued, chasing up the remaining jobs to complete the overhaul. 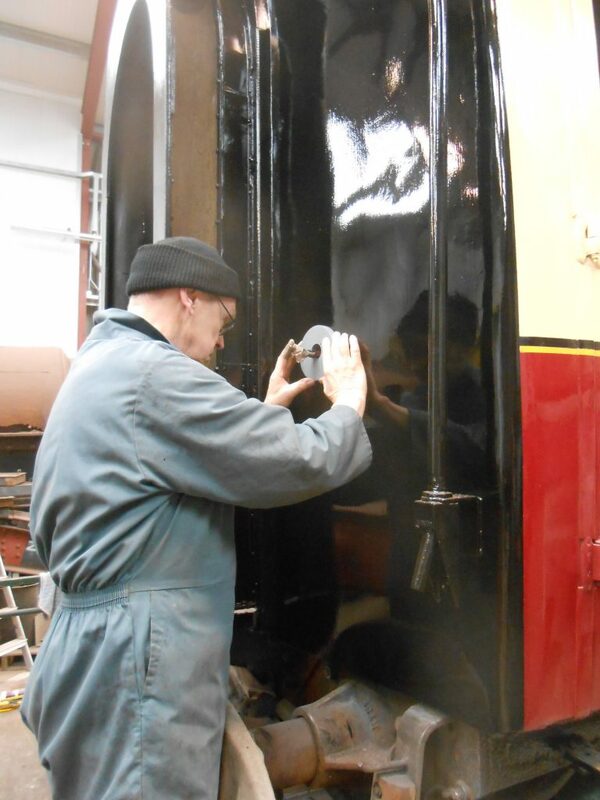 Tim has now completed the paintwork at the east end of the coach and Mike has just about finished the re-instillation of the toilet fittings. He mutters that at least mostly he’s been able to sit down on the job! 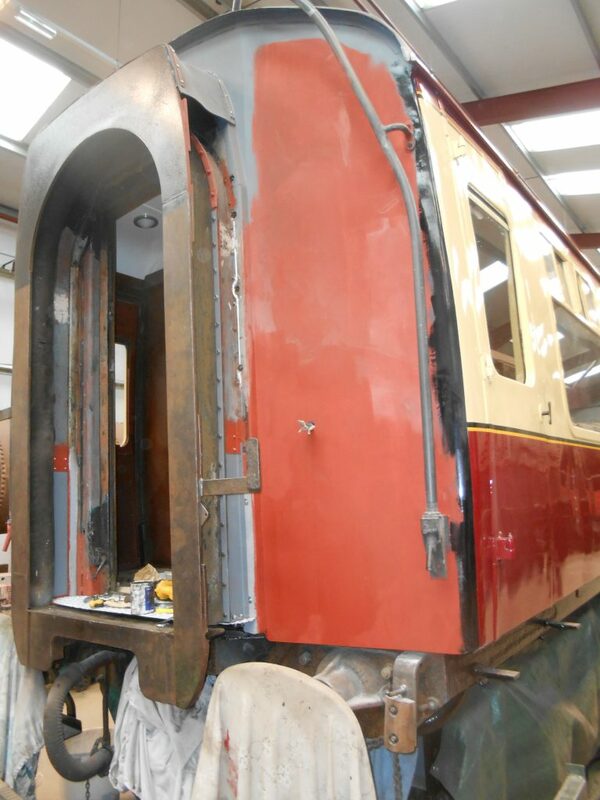 David has undertaken more clearance work inside and the coach is beginning to look more like its old self. The next major task will be re-fitting the melamine panelling and cupboards in the servery area. John has had a week off for good behaviour so will no doubt be raring to tackle some of these jobs when he re-joins the gang this week! 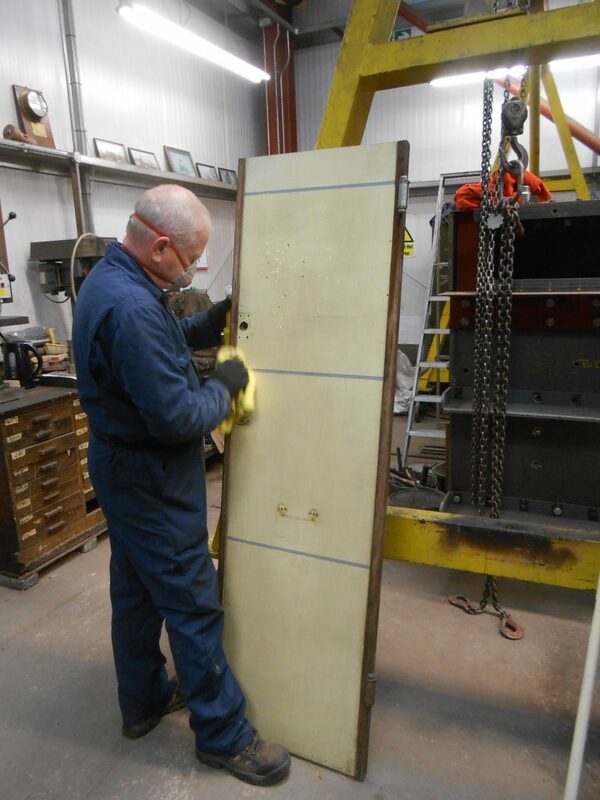 Paul has been busy cleaning down the new (to us) paint cabinet (which apparently needed discussion with Mike) and has made up a frame from which a mould for the new gas compartment door plate can be cast with the consumables purchased last week. Following the discovery of some unwelcome visitors to the CCT store outside, David, Tim, Matthew and Martin Clarke spent time on Saturday moving some of the more useful items to the new internal store in the first class North London Railway coach body. 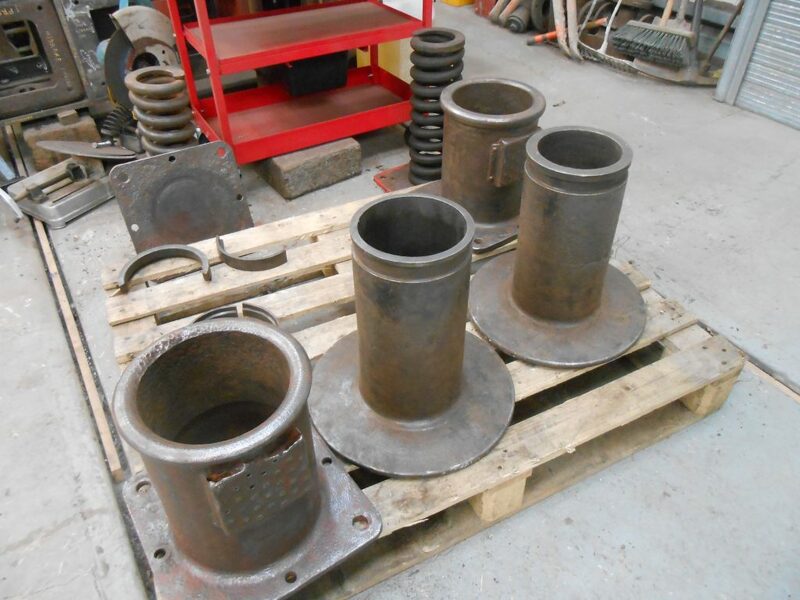 Keith has been busy again with the gas torch removing components from the front of Wootton Hall for refurbishment. Fred and Roger arrived late on Friday, having been delayed by yet another dead Class 37 on the Furness Line, to clean up the front buffers, including the springs which can be seen here. 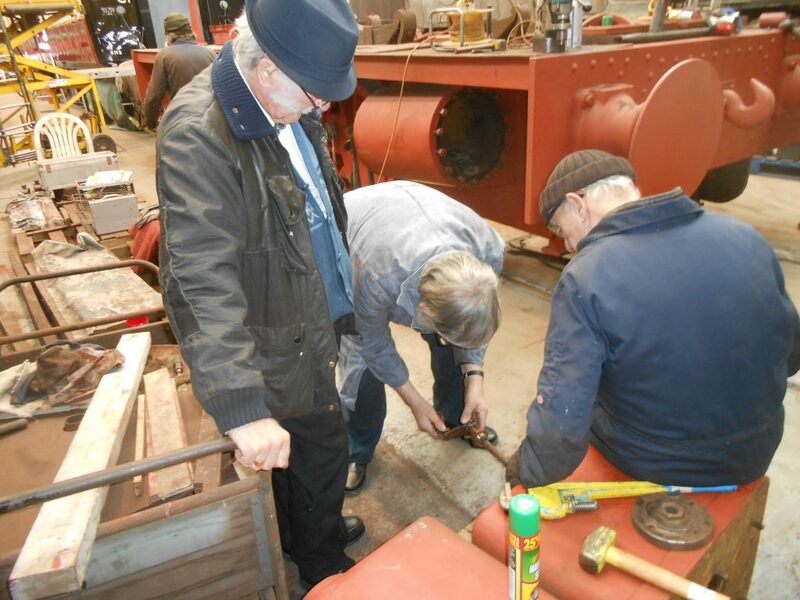 Anthony Jolly appeared on Wednesday to do some more work on Fluff, to be followed by Alan Ogden on Saturday, who is refurbishing the electrical boxes. Finally, Adrian has been making even more dust and noise in cleaning Caliban‘s frames and the sand boxes have been removed. 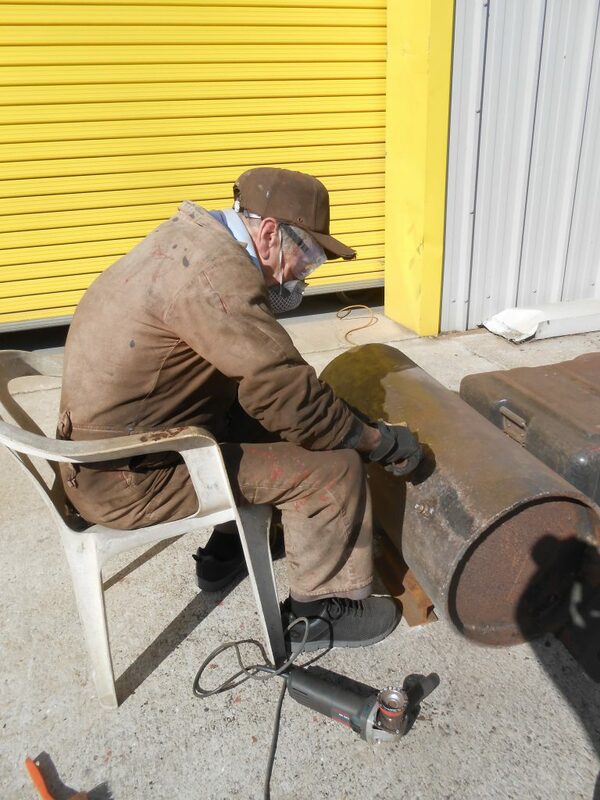 The sanding mechanism was found to have rusted up, and Howard took on the job of unseizing it through the age old remedy of hitting it with a hammer – with success. Breaking news this week is that 5643 is heading off from Embsay down to Norfolk as a late substitute in the line up for the North Norfolk Railway’s Spring Steam Gala on the 21st, 22nd and 23rd April. 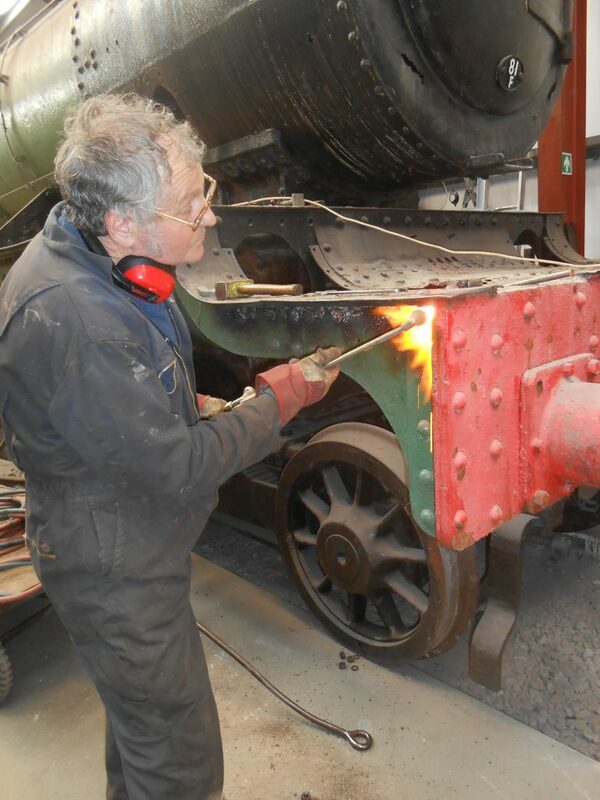 Although the move was first mooted last Wednesday, it depended on the Embsay & Bolton Abbey Steam Railway completing repairs to ‘Austerity’ 0-6-0ST Norman, which was eventually achieved to their satisfaction yesterday, Sunday, at which point a contract signed by both the FRT and the NNR was exchanged. The holiday by the seaside is only planned to be short as 5643 is due to be back in action at Embsay over the May Day Bank Holiday weekend. 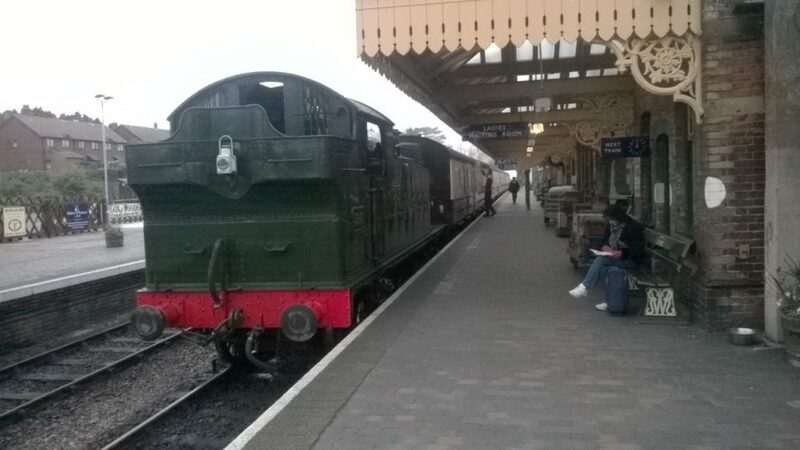 Alan reports that 5643 seemed in good form on Saturday when, on the last train, it hauled eight carriages and a dead Class 37 (we’re used to them on the Furness Line!) to Bolton Abbey. Last Tuesday saw the last gathering of the season at The Ale Emporium for the Preston Branch meeting when some video of the Great Central Railway was viewed. The usual gathering at Preston on Wednesday took place although Mike and Paul decided to spend some time away at the seaside (Southport) on the pretext of getting some gear to cast a new plate for the gas cover on the RMB. We will no doubt see the result of their efforts in the next week or so. 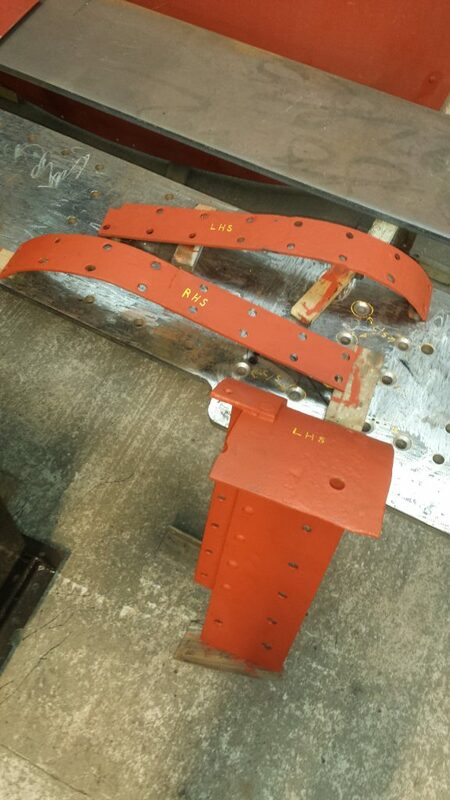 Meanwhile, John continued to reassemble the communication cord equipment on the RMB and affix the lighting connectors and dimension plates. Mike came in on Friday to follow up John’s work by re-installing some more panelling in the south side toilet after the communication cord chain had been reaffixed. The interior of the coach continues to be cleared of equipment, which is being stored on Mike Cook’s new shelves in the first class North London Railway coach body. This will make it easier to re-install the remainder of the interior panelling and to clean the seats. Adrian continued his work on Wednesday to rid Caliban‘s frames of rust and flaking paint. With Alan having a day off, Adrian was in full Vesuvius mode in terms of dust. He must surely be getting closer to finishing this task. 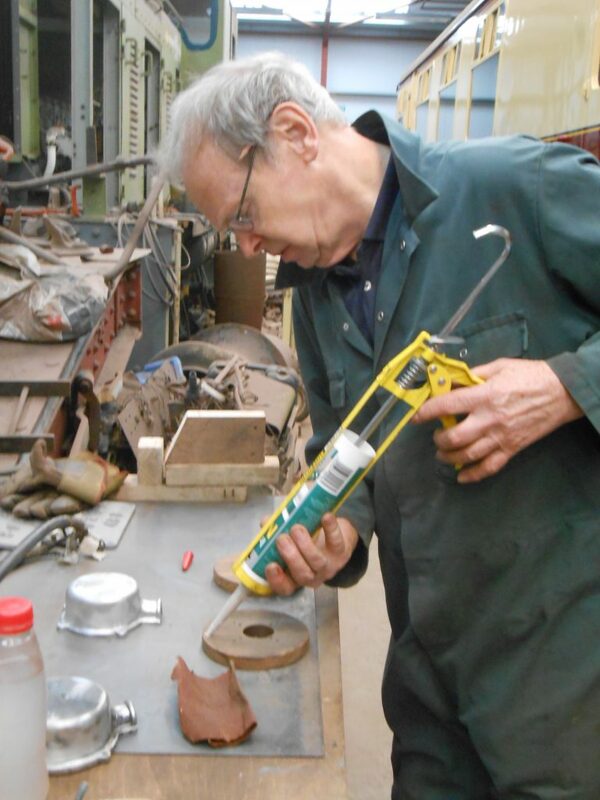 Talking of which, Howard is on the finishing straight in machining and fitting the hinge pins on the new lubrication pots for Caliban. 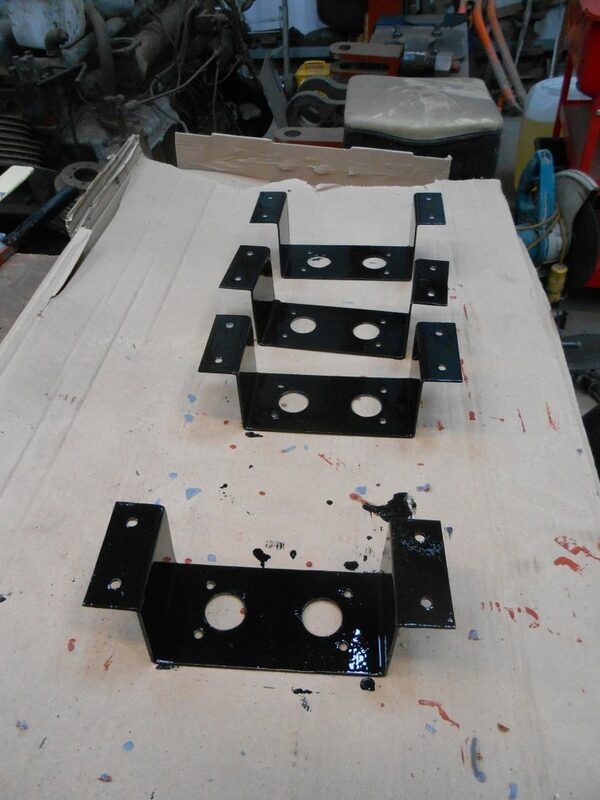 The support brackets are also starting to bear black gloss paint. 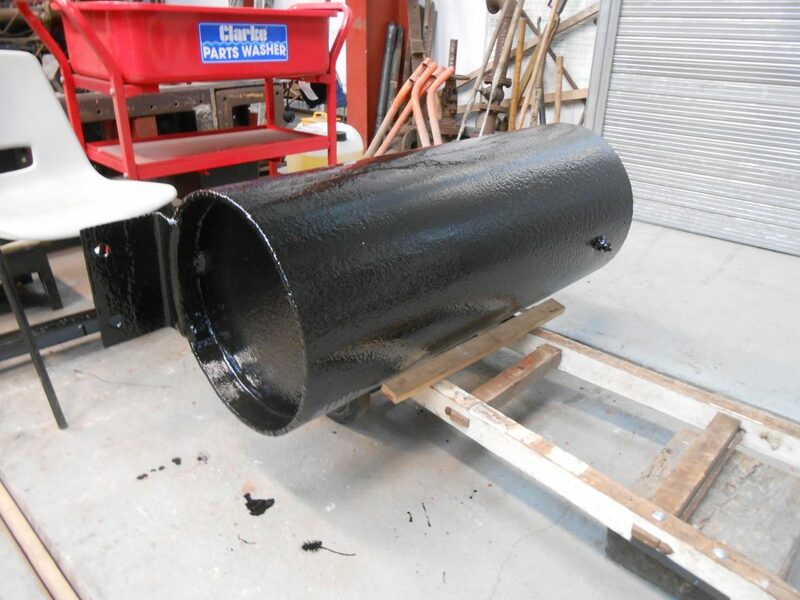 Work on Wootton Hall has continued with various components receiving paint after having been dismantled by Keith and cleaned up by Fred and Roger – a gleaming vacuum reservoir is seen here. 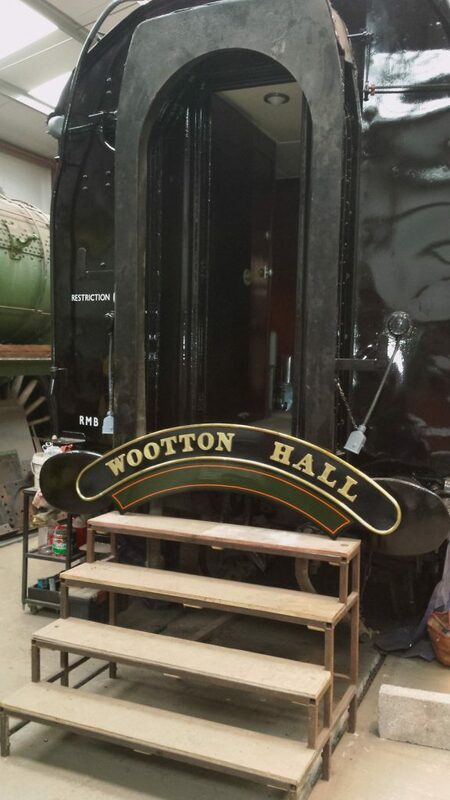 Keith also brought in one of Wootton Hall‘s nameplates on Friday for Derek to film as part of continuing documentary on the restoration of the loco. It is seen here with the RMB, which seems to have been temporarily named for the occasion! Tim finally managed to bring the casting for 5643’s new ejector ring down to Preston on Saturday, having coerced Neil into giving him a lift with getting it into the back of his car. It was removed at Preston by Keith in far simpler fashion with the aid of one of the fork lift trucks! We are sorry to have to start this blog with the news that long-time member, Bill Ashcroft, died last Thursday morning at the age of 82. We understand that Bill had just completed a course of chemotherapy the previous day following a diagnosis of lung cancer at the beginning of the year. He was certainly one of life’s characters and was involved at Haverthwaite in the early days, although an inability to drive through a medical condition resulted in a scaling down of his involvement. Bill then joined the support crew for the late Paddy Smith’s LMS liveried Black Five No. 5407 before transferring to the “dark side” of bus preservation, acquiring John Fishwick & Sons’ Leyland half cab double decker No. 10 which he restored. 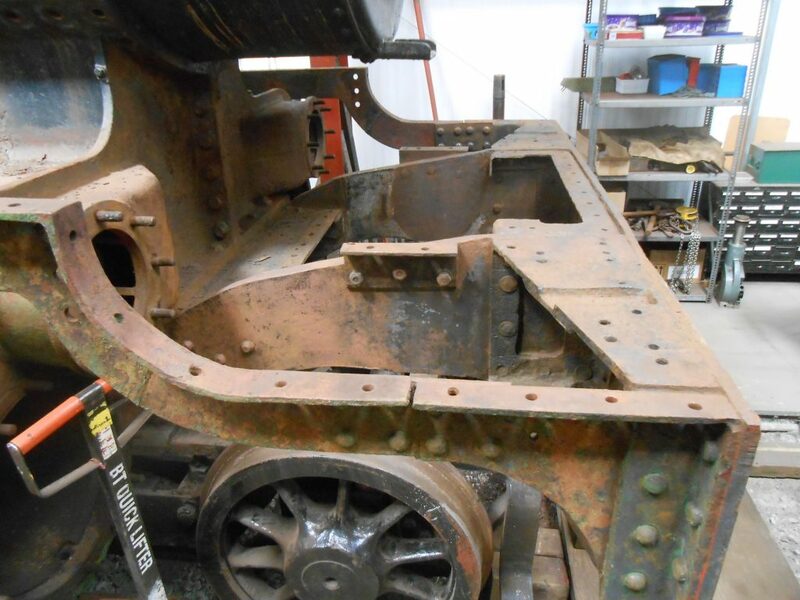 He latterly became involved with the restoration of a Leyland Lion. Bill took many railway photographs which recorded the end of steam and have been sort after by railway periodicals. He recalled to us how, when working at County Hall at Preston, he would nip off to the toilets, which held a prime viewing position overlooking the entrance to Preston station, in order to take photographs of passing steam traffic. 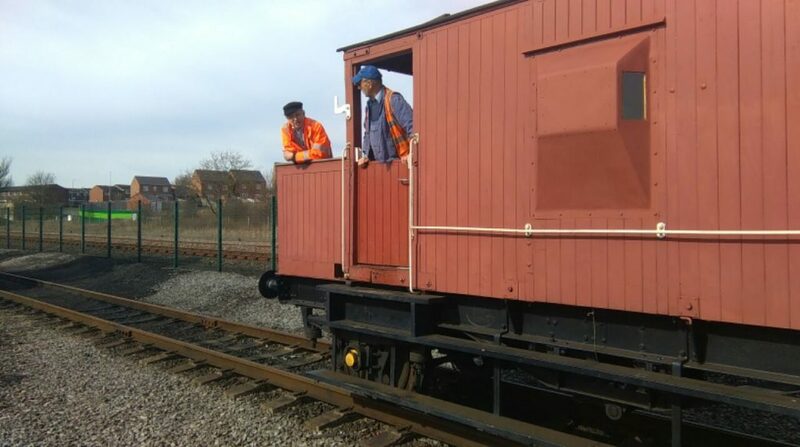 More recently, Bill started to make frequent appearances at the FRT’s new shed at Preston and we will miss his cheerful voice recalling old times. Our condolences go to Bill’s wife, Ruth, and his family. Work has continued at Preston this last week, although there was a pause in operations on Wednesday in order to observe sand blasting demonstration which had been arranged with a view to the RSR and FRT joining forces to buy some new equipment. The onlookers can be seen here along with a photo of the sand blaster attacking the frames of Wootton Hall‘s tender. The demo showed that the compressor would need some attention before it could be used for sand blasting. 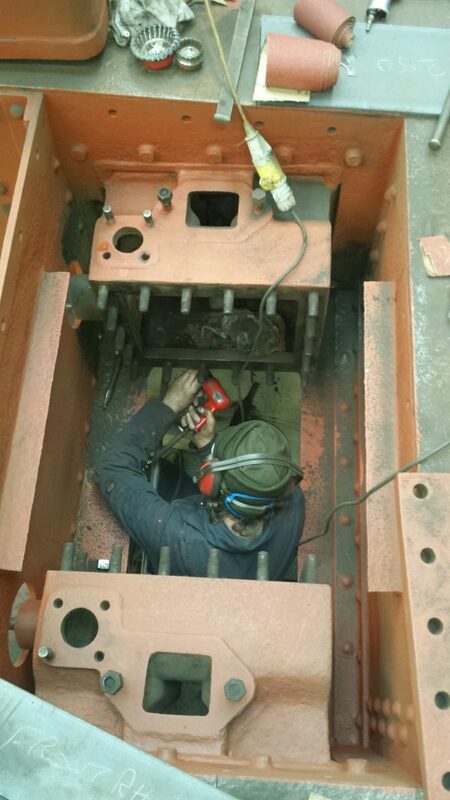 John has been busy re-fitting items on the RMB and can be seen here preparing one of the lighting cable pattresses. 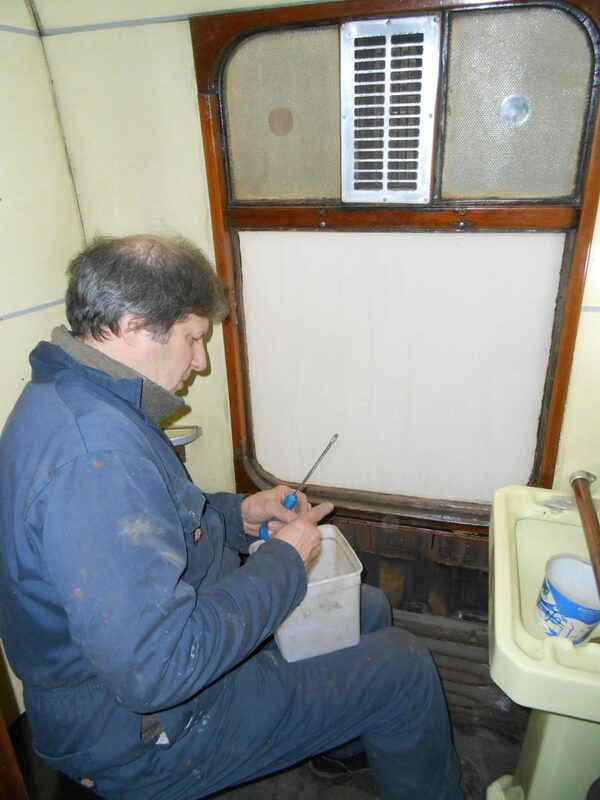 Mike has been back working in the toilets and Tim has varnished the east corridor end of the coach. 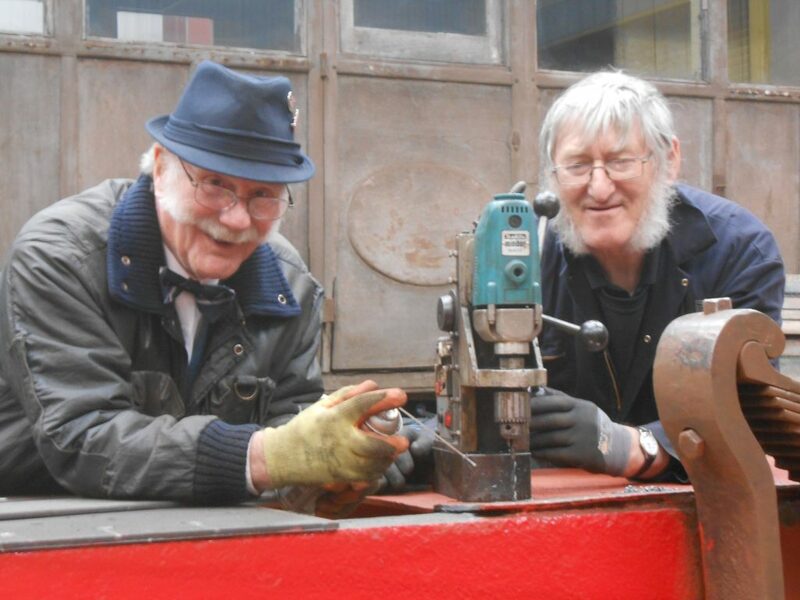 Alan and John H, seen here contemplating their next move, have been working on Caliban‘s running board and Adrian has removed some further scale and rust from the frames. 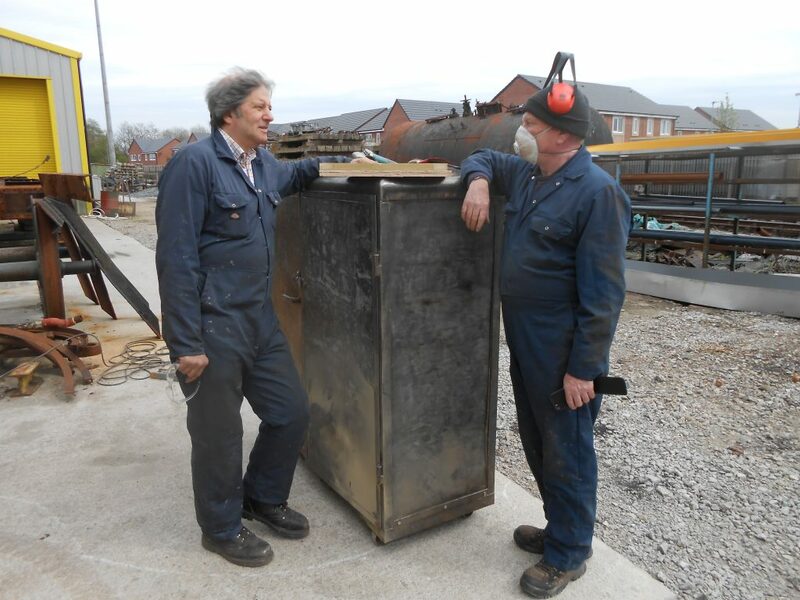 Keith and David have been filling the scrap metal skip with scrap tubes and components from Wootton Hall. George reports that work is proceeding at Shackerstone on Cumbria‘s big ends and a new clack valve. The loco should be back in traffic the weekend after Easter, subject to a satisfactory steam test. 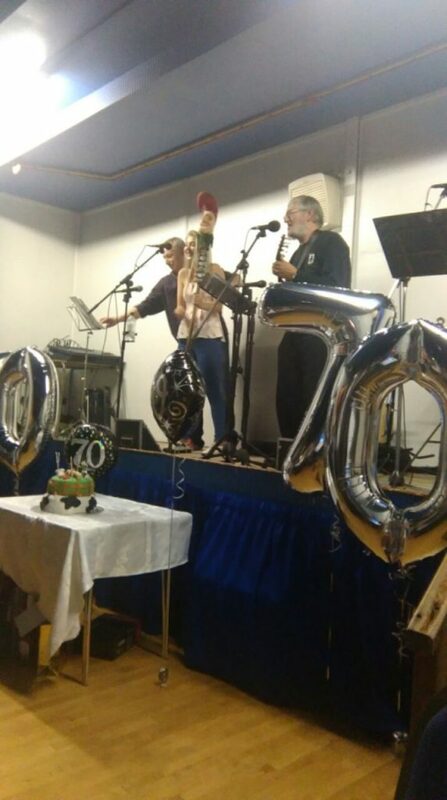 Our folk band Live Steam had a busy Saturday evening at a private 70th birthday party at Out Rawcliffe village hall, which seemed to be successful. Tim reprised his tuition of the zob stick to an unsuspecting female from the audience. Last call here for the final Preston Branch meeting of this season which will take place at 8 pm tomorrow, Tuesday evening, 11th April, at The Ale Emporium, Preston. Archive steam video will be screened. With Mike and Paul away on holiday it was left to John and Tim to continue with the work on the RMB. John discovered that, when lettering the west end of the RMB, Tim hadn’t left much room for the re-installation of the vacuum pipe that connects to the communication cord valve. That meant either re-lettering the end of the RMB or John making some adjustments to the pipe which, as a true gentleman, he did! Phew! 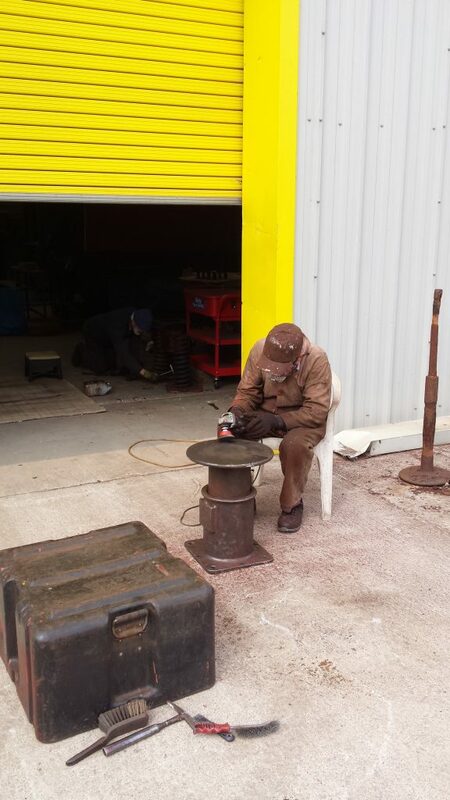 John also removed and repaired one of the toilet heater coils, which he is seen here inspecting. 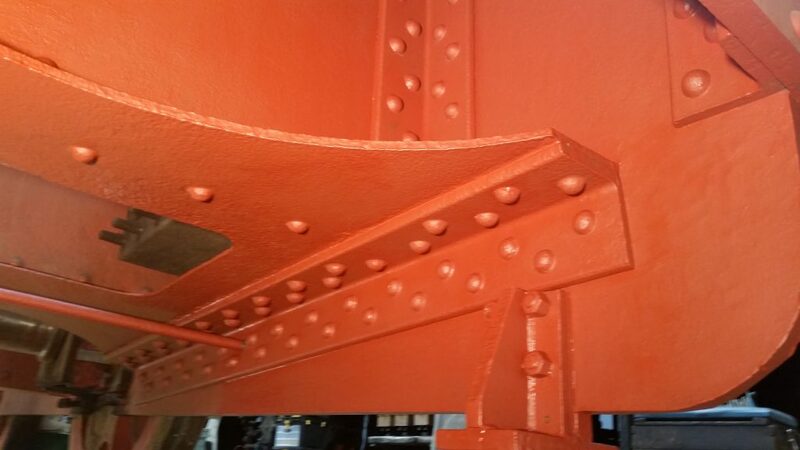 Meanwhile, at the other end of the RMB, Tim undercoated and then gloss coated the east end. Lettering and varnishing are still required when there is a break in the dust. After hearing that we had made good use of the shelves that he had donated to the Trust, Michael Cook kindly arranged for the delivery of another set, which David promptly erected on Saturday. Thank you Michael – very much appreciated. Adrian continued his assault on Caliban‘s frames with the needle gun and cup wire brush on Wednesday. 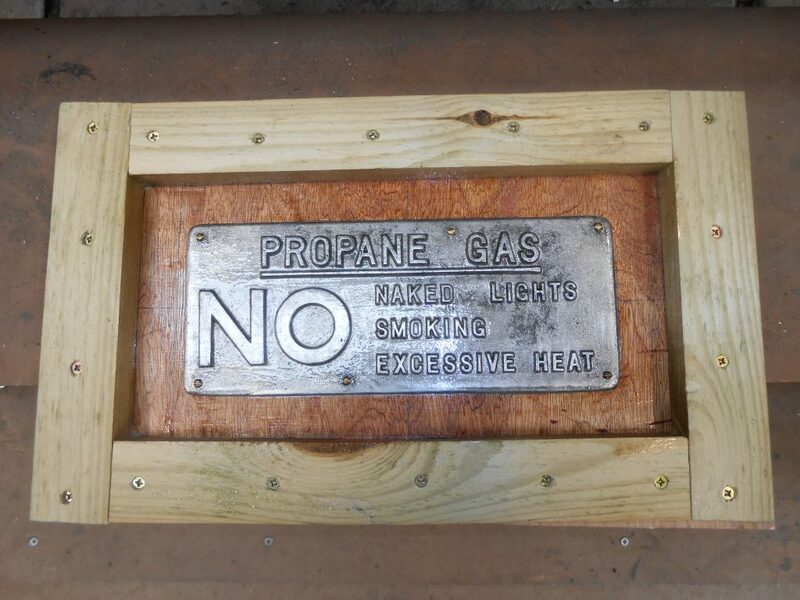 The new piece of running board, having received two coats of primer and undercoat underneath, was mounted on top of the frames. Alan then went on to remove another piece of plate. George appeared on Friday and worked with Keith to place some of Wootton Hall‘s scrap metal in the newly provided waste skip outside the shed. Fred cleaned up Wootton Hall‘s vacuum reservoir whilst Roger primed Caliban‘s wheels. The task of procuring new components for the Trust can have unexpected repercussions. We’ve previously had Alan arriving home to find FR 20’s new cab spectacle plate outside his home in Blackpool, or David having to inform the driver of an articulated lorry that was trying to access his suburban road in Huyton that his delivery had been arranged to go to Appleby, not Huyton. 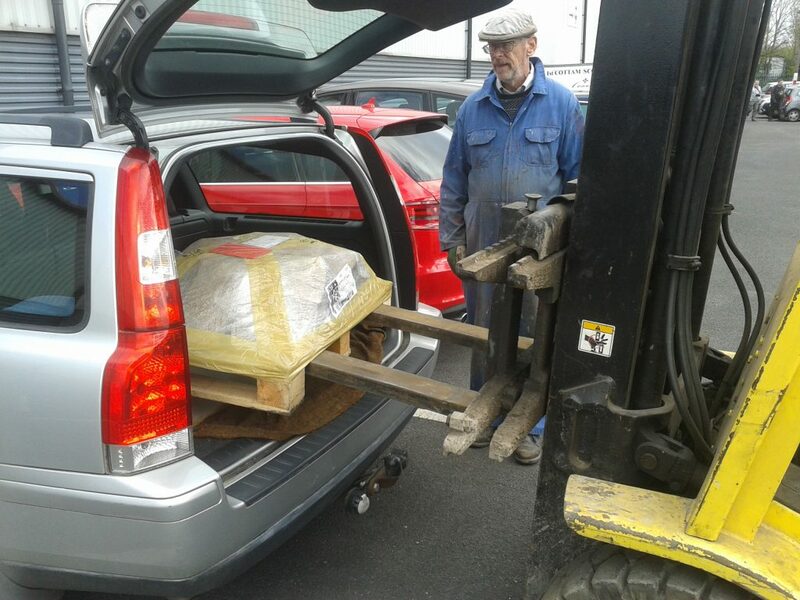 So, this week we have the good news that the newly cast ejector ring for 5643 has now been delivered – the bad news is that the pallet load needs to be humped into the back of Tim’s estate car at Cark to be moved on down to Preston! Mrs O thought that it was all rather funny until she realised that she would need to give a hand with the lift! 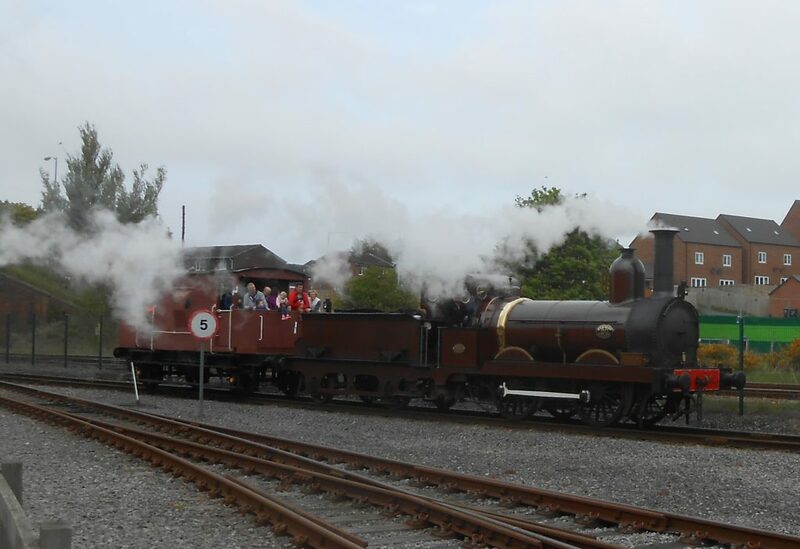 The RSR’s Steam Gala over last weekend was well patronised and saw the guest appearance of Peckett 0-4-0ST No. 1163 Whitehead from the Midland Railway Centre. Keith, Alan and Tim were in action on the locomotives, whilst Alison made some useful money with the sales stand and young Matthew provided some useful assistance to the Family Focus Group in the museum. 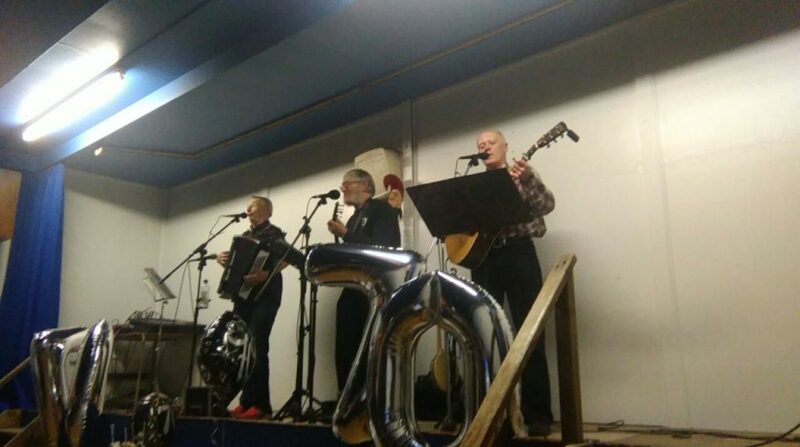 This next Saturday sees our fund-raising folk band Live Steam in action at Out Rawcliffe Village Hall in the wilds of North Fylde. Will they ever make it to the Albert Hall?! Another practice is being held at Cark on Wednesday evening, although it maybe preceded by a weight lifting session (see above). Finally another reminder that the final Preston Branch meeting of this season will take place at 8 pm on Tuesday evening, 11th April, at The Ale Emporium, Preston. Archive steam video will be screened. It was a quieter day at Preston on Wednesday with Alan braving the snow to go to Shildon once the snow gates on the A66 had been lifted. Tim was also away which left John working away sanding gangway metalwork at the east end of the RMB whilst Mike continued the reassembly of the toilets. 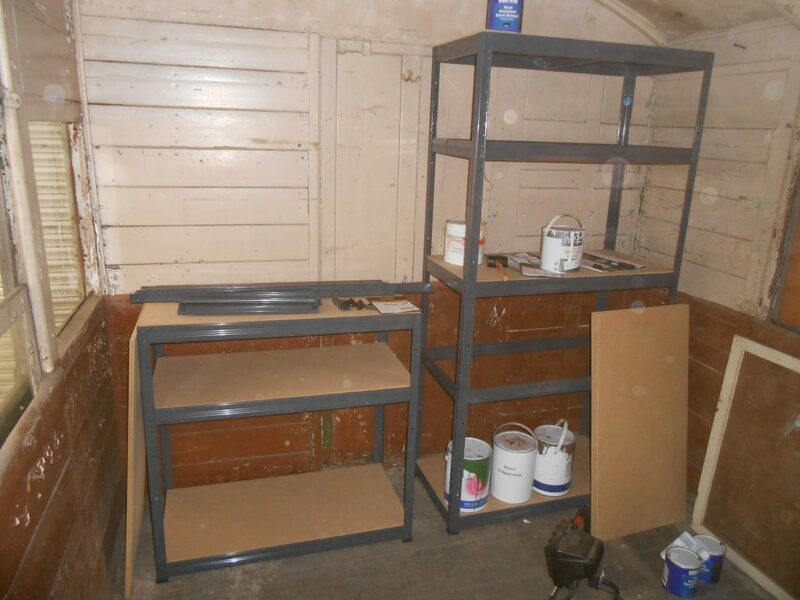 David has now finished the assembly of the new shelving in the first class North London Railway coach body and he and Tim spent some time on Saturday stacking paint cans and other C&W consumables from the interior of the RMB. However, Adrian broke the silence in the shed with the needlegun around Caliban‘s valve chest. 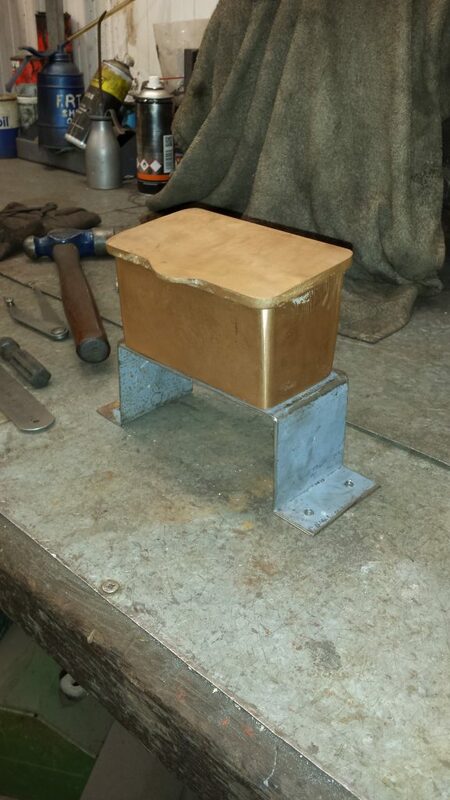 Howard is still busy with Caliban‘s new lubrication boxes, making stands for them, and happy that his precious knife and fork survived the fall of the North London Carriage door on his tool box last week, which didn’t fare as well. Keith has been removing more platework and also the vacuum reservoir from Wootton Hall in readiness for Fred and Roger to clean and apply primer paint. Last week’s output from Fred is seen here. Alan and Alison had good weather up at Shildon over the weekend and Alan and Tim were successfully re-assessed for driving there on Thursday and Friday. 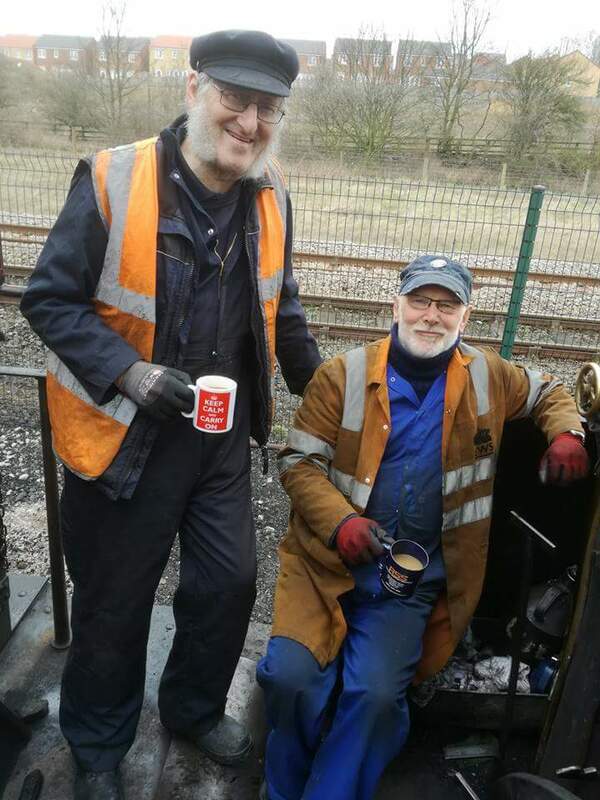 Alan is seen here on the footplate on Thursday whilst Tim is seen acting as guard with Martin Clark on Friday whilst Anthony Coulls is assessed. 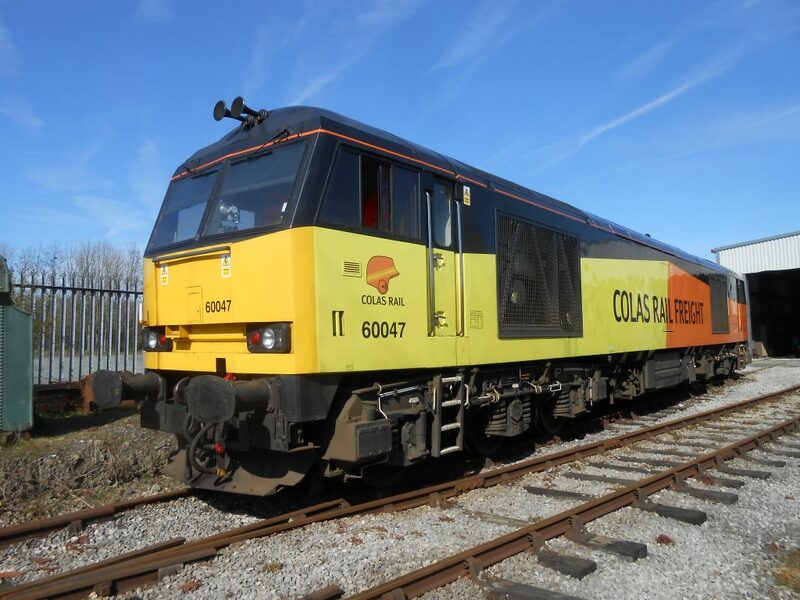 The Ribble Steam Railway’s Diesel gala took place over last Saturday and Sunday and the photo of visiting Colas locomotive 60047 shows it outside the RSR running shed during the driver’s lunch break on Saturday. This next weekend will see the RSR’s Steam Gala with four engines in steam, which will keep Keith, Alan and Tim busy. A first reminder here that the final Preston Branch meeting of this season will take place at 8 pm on Tuesday evening, 11th April, at The Ale Emporium, Preston. No doubt more steamy videos to watch. This week we start by reporting the passing of our 110 volt Makita hand drill, which was purchased as long ago at 2001. Sixteen years of hard use can’t be bad and, after some discussion about the characteristics required of its successor, it has been replaced by a new, slightly more powerful, Makita drill which arrived on Friday. We look forward to another sixteen years of productive use….. The seemingly never ending work on the RMB continued again this week. John has just about finished his endeavours at the east end of the coach and it is seen here ready for the final coats of paint – the view rather belies the amount of work that John has put in to bring the metalwork back up to standard. John is aiming to get around to the west end next week in order to re-instate the passenger operated brake mechanism, otherwise known as the communication cord. 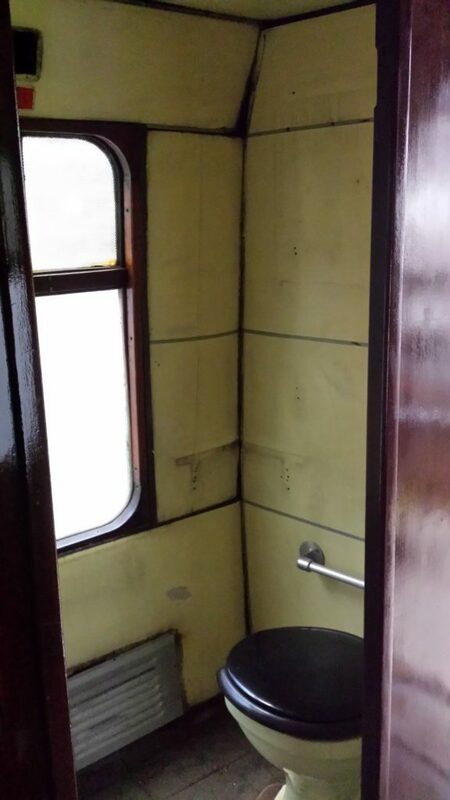 This will enable the panelling on the south side toilet to be completed after the communication cord has been permanently re-attached to the frame of the coach. Mike Rigg has been busy completing the re-installation of fittings in the north side toilet and can be seen here contemplating his next move. 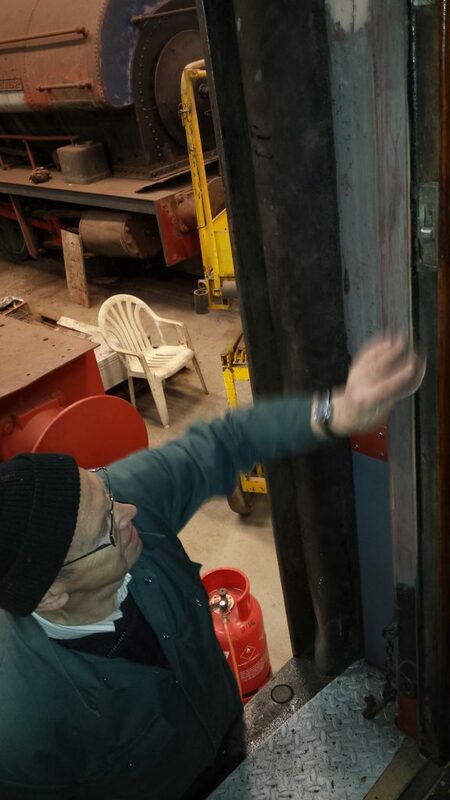 Paul is seen cleaning the door ready for fitting. 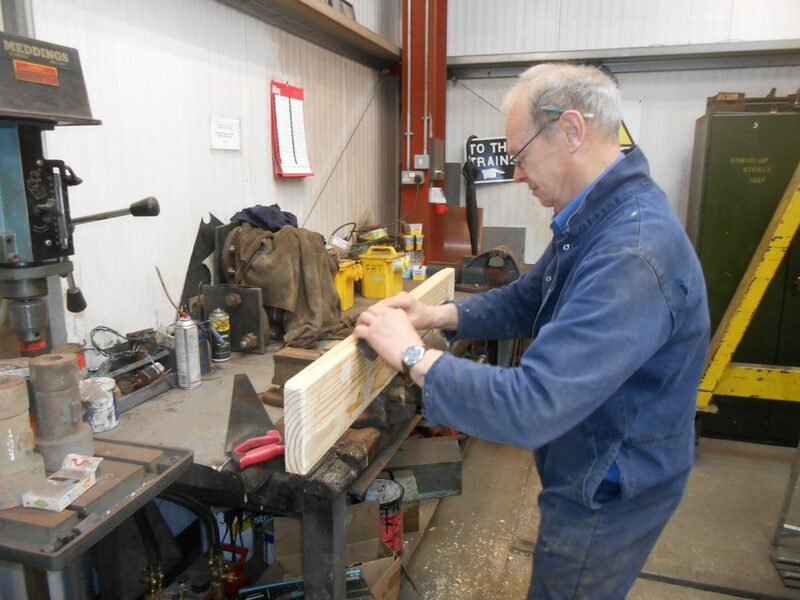 With a need to start emptying the RMB, which has acted as a store in recent years, David has been erecting the shelving, kindly donated by Michael Cook, in the first class North London Railway coach body. It is seen here in partially constructed condition. David has now finished the job and some of the equipment has already been moved over. However, at Adrian’s suggestion, David took it upon himself to clean the windows of our new store so that we can see our way around only to find that most of the muck removed was Adrian’s dust! Just need now to replace the exterior door which fell off on Saturday..
Adrian continues to create that cloud of dust above Caliban as he cleans up the frames with both needle gun and cup wire brush. 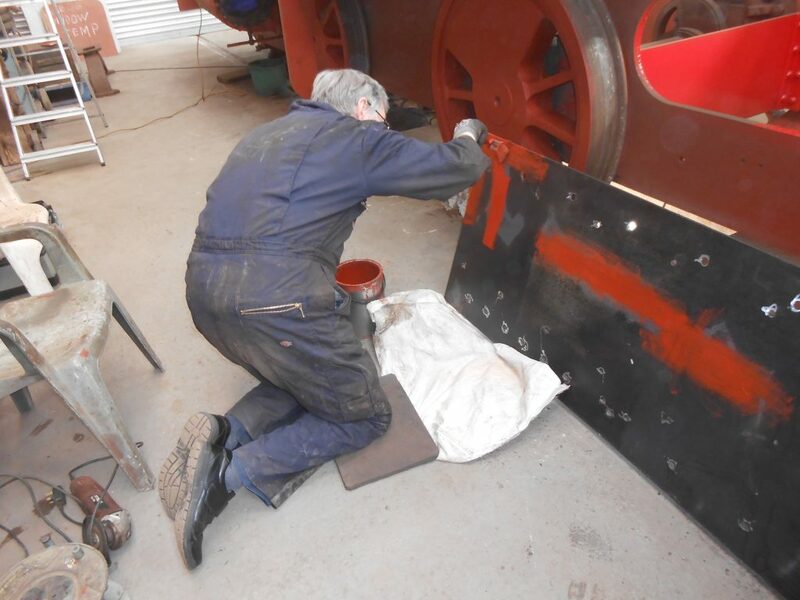 Alan is seen here with paint brush in hand putting red oxide on what will be the underside of the new piece of Caliban‘s running board after having received tips of the trade on painting from none other than Adrian! Some grey undercoat was subsequently applied on Friday by the C&W team. 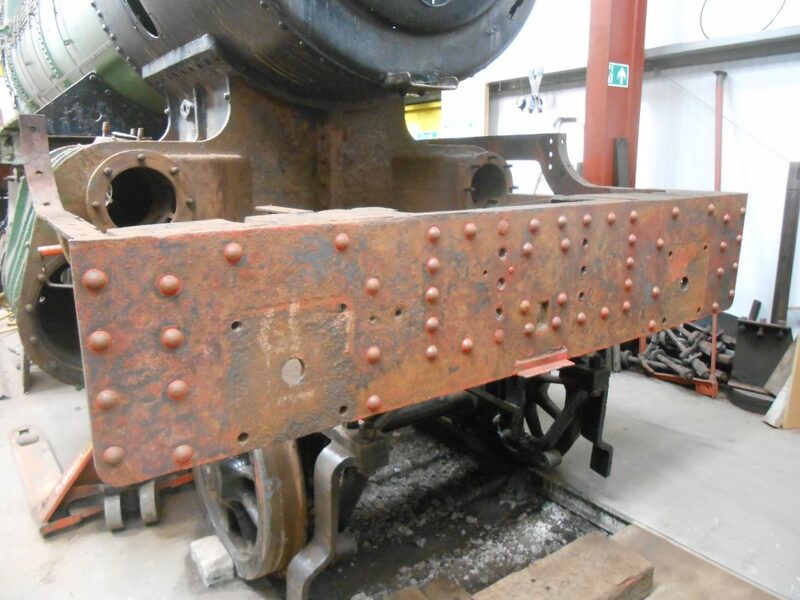 Work has also continued on Wootton Hall where some of the firebox back head cladding has been attached in order to mount some of the fittings temporarily on a test basis. 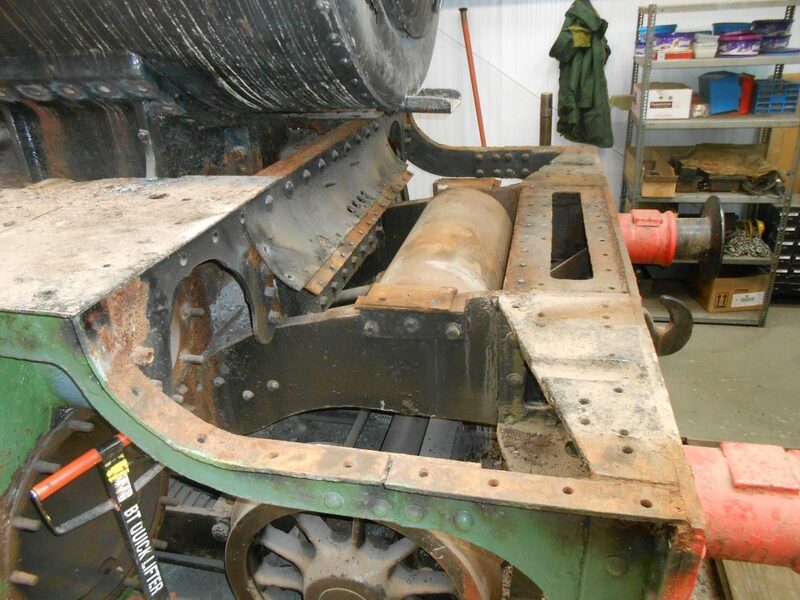 Keith has also removed some of the engine’s platework adjacent to the front bufferbeam so that it can be cleaned up and painted. 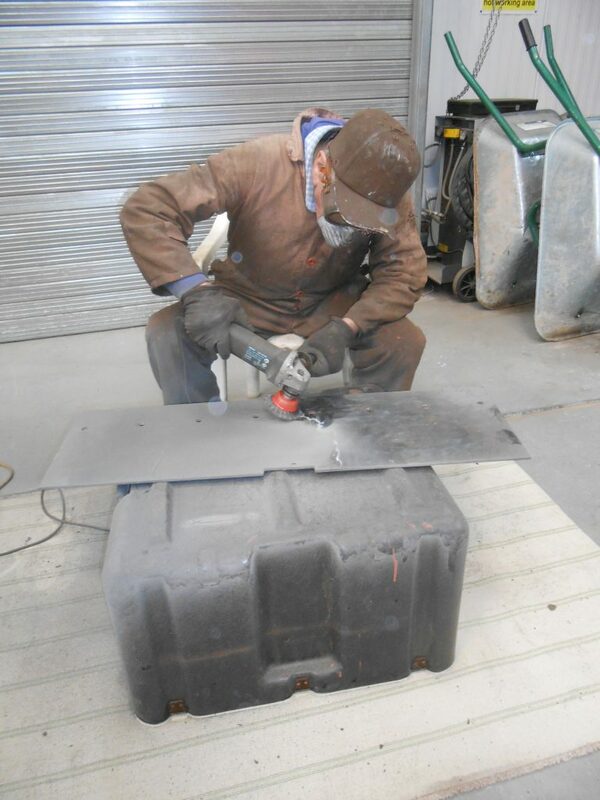 Fred took on the challenge of wire brushing the plate on Friday and can be seen at work here. This next weekend sees the opening event in the RSR’s operating calendar with the Diesel Gala on the 25th and 26th. A Colas locomotive is due to attend on the Saturday. Over the Pennines, Alan will be looking after FR 20 during four days of steaming, starting on Thursday for two days of driver assessments (Tim also attending Friday) and then two days in traffic. 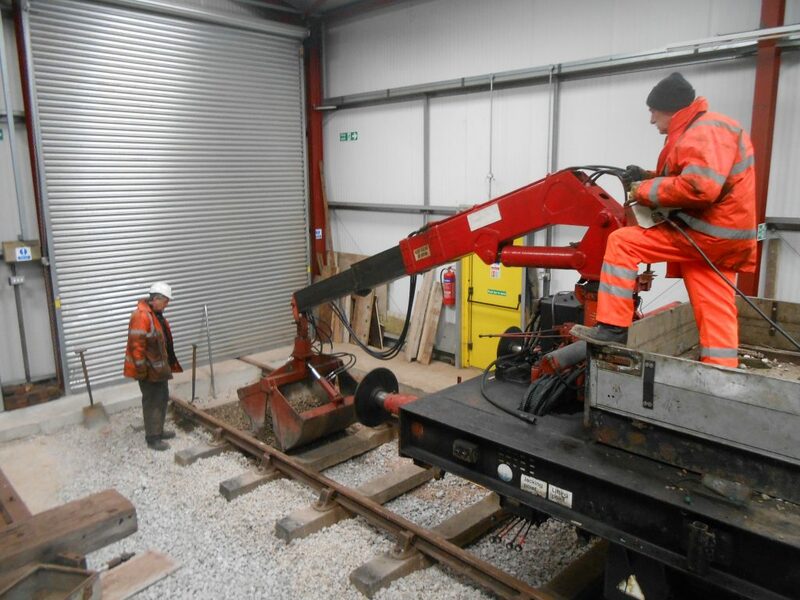 Road four in the unheated area of the new shed received ballast up to the top of the sleepers, as can be seen in this photo where Keith is watching Phil Preston operate the hydraulic grab on the RSR TRAM. The day when we will be concreting (or the ‘C’ word as John termed it last week) again draws ever closer. John has been busying himself completing floor repairs at the east end of the RMB and Tim has applied a first coat of primer over the recently completed body repairs around the corridor connection. Mike Rigg has almost completed the re-installation of panelling in the first of the RMB toilets. A clear out of the vast amount of paraphernalia in the RMB – some useful and some for the skip – has started and David Rimmer is clearing a space in the first class North London Railway coach body to accommodate the useful items. Michael Cook kindly donated some shelving a little while ago and it is planned to erect this in the coming week or so. 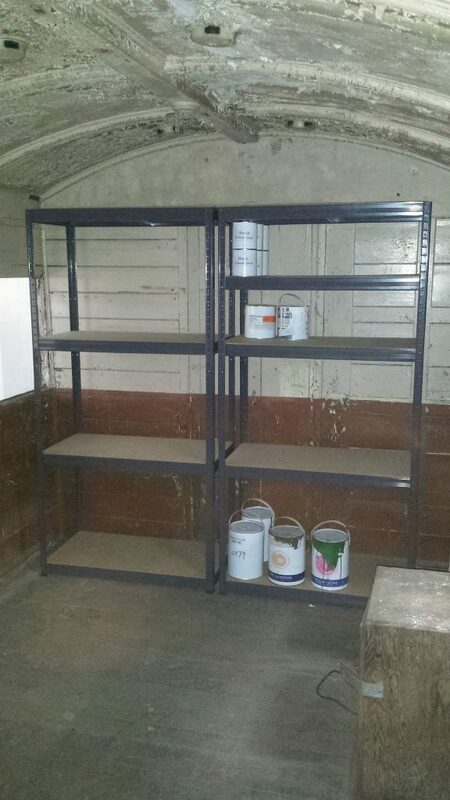 In addition, Paul Newton is breathing new life into the old RSR paint cupboard in readiness to receive the paint cans that are currently stored in the RMB. 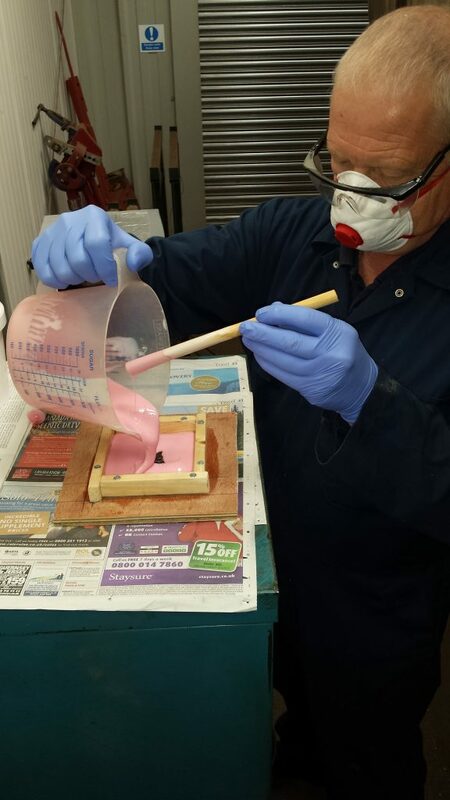 Elsewhere, Adrian has been making more dust (Wednesday) on cleaning up Caliban‘s frames followed by Fred on Friday. 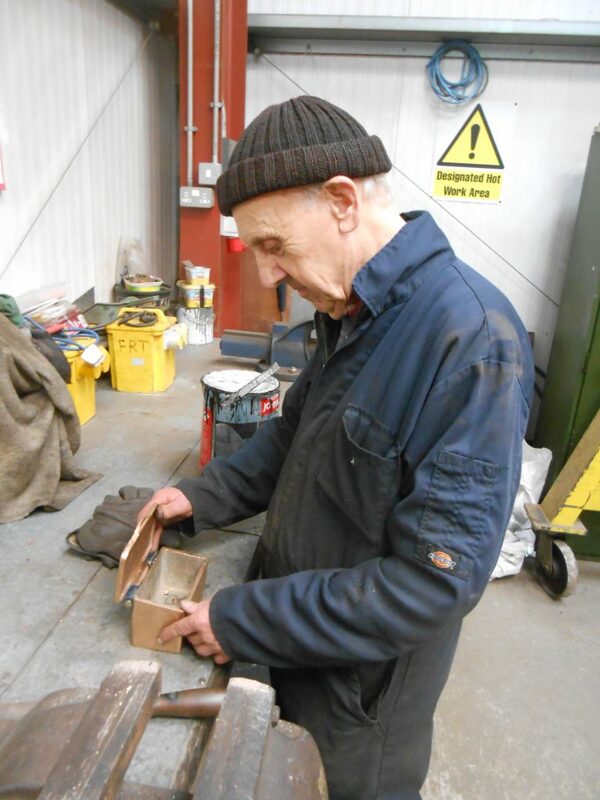 Alan was also busy on the project on Wednesday, when we had a visitation from long term member, Neil Glover. 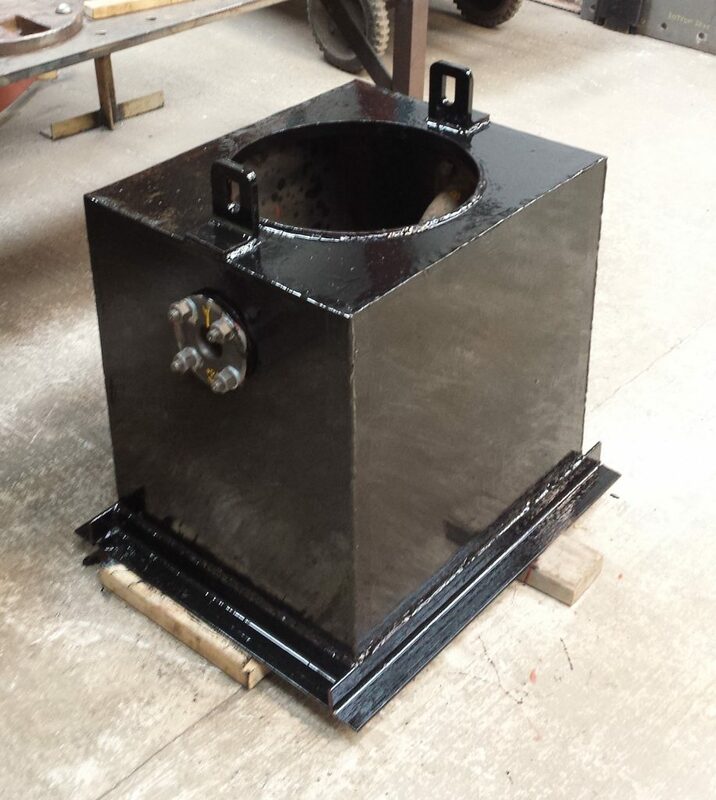 Keith has also been busy with the new water collection chamber which will eventually be fastened under the new tender tank for Wootton Hall, when commissioned. As can be seen from the photo, it is now getting to the paint stage.